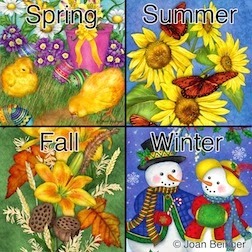 Joan Beiriger's Blog: Art Licensing: When do you Submit Art to Manufacturers? I was wondering if there is a list of manufacturers that you were talking about? I'm new to all this and little confused on who are the manufacturers as opposed to the agents and POD services (like Society6).. Thank you Joan for the great information. Hi Joan! This information is really helpful. The links are super. After investing over a year in learning about the licensing business, I am finally beginning to understand. Your articles are very helpful. And I loved what you said about following up with contacts. Most people are nice and they will give you a bit more information that you didn't have before. Thanks Joan. Helpful information. Great suggestion on the "art call-out lists" - never even knew those existed. Terrific concept, but crazy business…one needs a day job! Go right ahead Zakia. I encourage everyone to link to my articles. I just don't allow people to lift my articles from my blog, put them on their own blog/website, and don't give me or my guest authors credit. WOW! Thanks for all of this information and your time! I will be in my first SURTEX in May. The information you share here is so incredibly valuable. Although I have been a touring artist for over 20 years, I am learning that there is such a supportive group of really talented and sharing artists in the licensing world of which you are one. Thanks again for your advice and time.